Happy New Year from Consuming LA! As the food scene in Los Angeles continues to get more and more innovative and exciting, I will be there to bring the best (and sometimes the worst) to your attention. I’ve got a great 2012 planned for this blog and have already made a few changes. Please check out my new Manifesto. Also, I’ve created indexes to make it easier when you’re using the blog as a reference guide to pick a place to eat. Now you can search not only by neighborhood, but also alphabetically and by type of cuisine. There are also separate lists of dessert places, food trucks and places which are suitable for special occasions. More changes will be coming in the New Year. See you on the other side! I am enjoying your food adventures. Miss you at the gym – I sure hope you are getting there given this new passion. Had a great time at Vermont and The Barre with John Hughes. 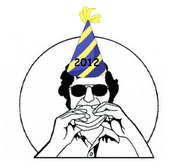 Thank you for the nudge, Howard and here’s to an even better tastier 2012!